The City of Mauldin unveiled its fourth installation along its Public Art Trail on Wednesday, December 12th at 5PM. This year, artist Arrington Matthews’ sculpture entitled “The Groundbreaking” exemplifies the theme “Industry of the Upstate” by portraying the ever-changing face of industry — from where we began to where we are heading. Arrin Matthews has been a metalsmith with John Boyd Smith Metal Studios since 2012, where he designs, creates, and finishes architectural commissions. Skilled in design, welding, forging, and metal fabrication, his work is represented in Florida, Maryland, California, Hilton Head, SC, Savannah, GA, and now Mauldin, SC. Matthews is also a firefighter with the Mauldin Fire Department. Being an employee of the City, he is intimately aware of the growth Mauldin has seen recently and chose to focus his piece on the City’s industry. 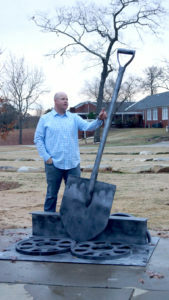 The focal point of “The Groundbreaking” is a six-foot-tall shovel rooted in a chunk of actual railroad track and painted with a skyline graphic. The overall effect is a representation of the changing face of Mauldin from a railroad-rooted city to one that has expanded to include a variety of industries. Large metal gears round out the piece, indicating the combination of Mauldin’s current businesses and tourism efforts working to create a forward-moving city. To learn more about the installations along the Public Art Trail or how you can submit an application, please visit the Cultural Center’s website.